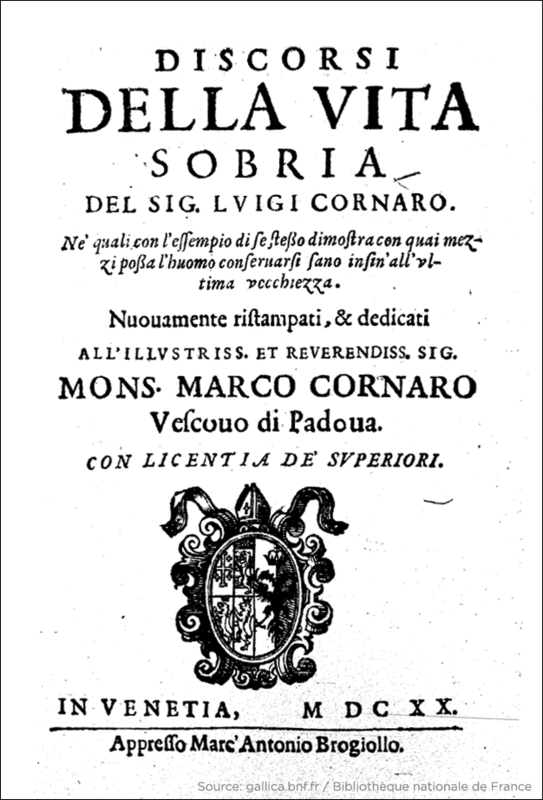 His book, 1620 edition. Courtesy of the Gallica digital library. The diet regimen was strict: only 12 ounces of food per day, and 14 ounces of wine. By contrast, the average American today eats over five pounds of food daily, meaning Luigi ate less in a week than we eat in a day. Most meats were cut out (fish and poultry, mutton and kid were still on the table), and what little bread he ate was made with course wheat meal, not “fine flour”. Almost all the rest of his nutrition came from egg yolks and soups. Despite the severity of his diet, his book was pretty popular. We don’t know exactly how popular, as such records weren’t generally kept, but even 450 years later surviving copies aren’t particularly rare (meaning he probably printed a lot of copies) and it was popular enough to be worth pirating by at least one competing printer. Historians disagree on how long Luigi finally lived, but all accounts agree he at least reached his eighties. Some sources claim he lived to 102 or 103, thus fulfilling the titular promise of the world’s first fad diet book. Previous PostPrevious Why Is The Dollar Sign A Letter S?